Fleece Throw or Superhero Cape? You decide. 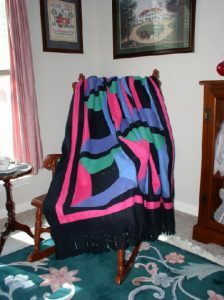 Made this Window Pane pattern fleece throw for my great-nephew, who was already grown man at the time. He was ecstatic. Now, he and his girlfriend wrap up in it, when the weather’s cold, as is the case often where he lives, to watch TV. At least that’s the story he’s telling me. The project had started some years earlier as an Electric Quilt virtual project that I’d created as a means to learning about the EQ software. Regretfully, it languished on my computer’s hard drive for years before I decided to share it with anyone. When I finally got around to making it into a real project, I was surprised and please at how quickly and easily it went together. I’d embroidered a few quick-fleece throw and pillowcase projects, but I hadn’t tried my hand at piecing one until this project. Of course, I sold it as a long and arduous labor of love in which I’d invested many sleepless night and endure excruciating pain as I pricked myself repeatedly with straight pins, nearly slicing off valuable flesh – on more than one occasion – with my rotary cutters, as exhaustion overtook me. Whether it was my over-acting of the quality of the project, it was a hit. If you have a quiet afternoon, a stash of fleece and a purpose in mind, consider trying your hand at this. While I left out the instructions on how to transform it into a proper superhero’s cape, if you’re making it for the right person, then the cape part is implied. For those who don’t dabble in EQ, I’ve included a PDF of the instructions in the same zip file as the EQ project file. Or, you can simply read them here. Just grab the zip file, at the tutorial page. There is no fee. The pattern/instructions are FREE. Why EQ? If you’re a visually oriented person like myself, you’ve got to be able to see it to image it. Electric Quilt allowed me to tinker with everything from color schemes to dimensions to yardage budgets, until I got what I wanted, which was a project that matched my fabric stash with the color preferences of the recipient. I was just a little surprised that I had so much black fleece on hand. Got a superhero cape story you’d like to share?